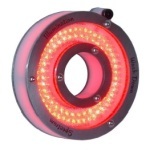 This 4” ring light, designed for washdown environments, is IP68 compliant. Its enclosure is constructed of FDA compliant materials, including 316 stainless steel and white delrin. All gaskets are either FDA compliant silicone rubber or white nitril. This light has been hydrostatic tested. The built-in strobe controller may be connected directly to 24 VDC power. A 4-meter washdown cable is included.